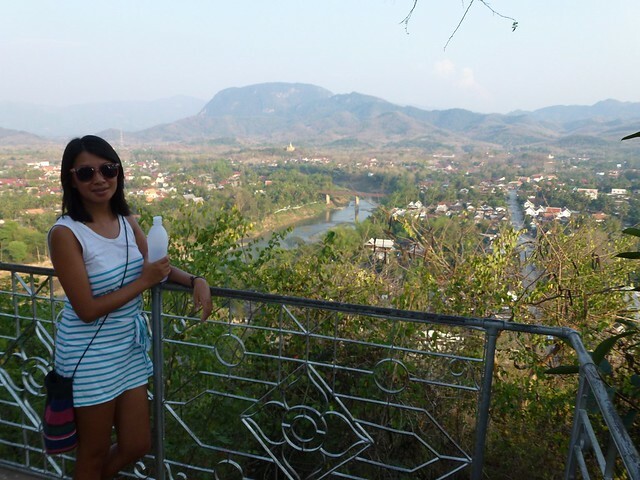 It’s time to move on, this time to the notorious backpackers mecca Vang Vieng, the home of tubing. We took a minibus which would take 6 hours. 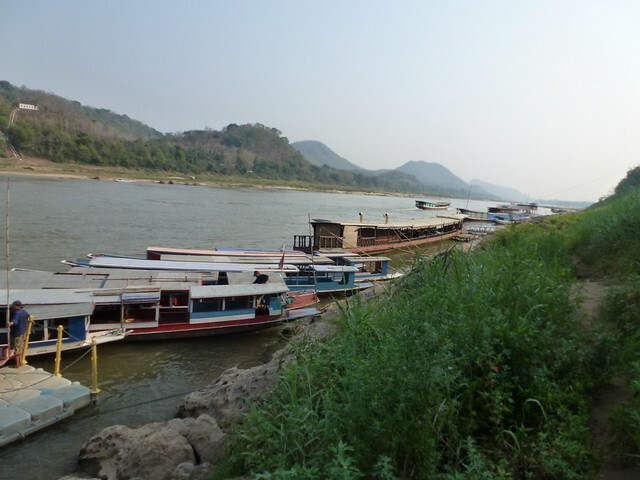 The snake-like route from Luang Prabang to Vang Vieng was also notorious for causing people to be sick and it seems that the fish from food street would reappear from John again. 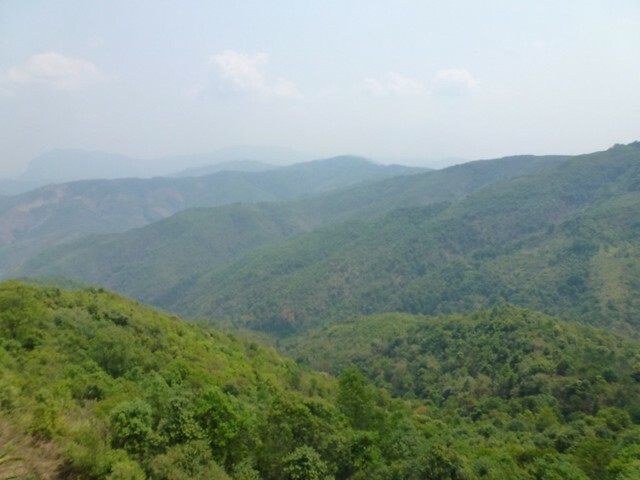 We stopped after 2 hours at an amazing view point, at this point he was ok.
To be honest, he did really well until 4 hours into the journey. The road was bumpy and really windy. We stopped at a “service station” and John ran out and straight to the toilets where we vomited from travel sickness and got diarrhoea from food poisoning. He spent the entire break inside the toilet before the driver gave me a nudge to get him out as we had to leave. It was only meant to be a 10 minute stop but we were there for 20 minutes. We returned to the car and John was pale and sweating. He looked awful and I felt so bad for him. We carried on for another 30 minutes but the driver had to stop for him to throw up again, right in front of loads of school kids who thought it was hilarious. 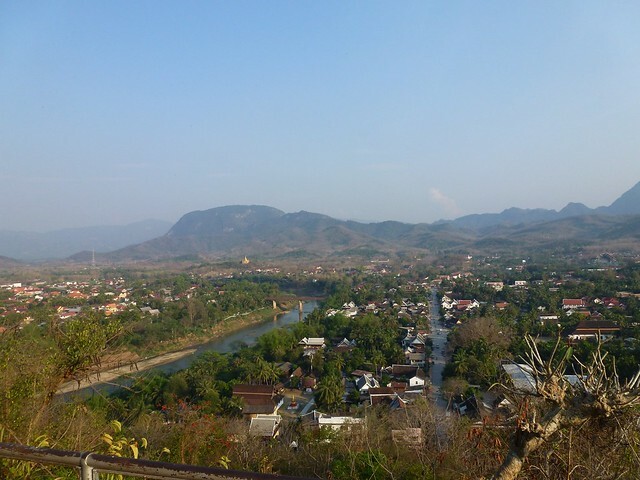 Luckily we got dropped off outside our guesthouse in Vang Vieng, but that wasn’t close enough. He crossed the road and threw up at the front of the guest house. John was ill for the rest of the day and stayed in bed and on the toilet. It didn’t look like he would be going tubing any time soon. 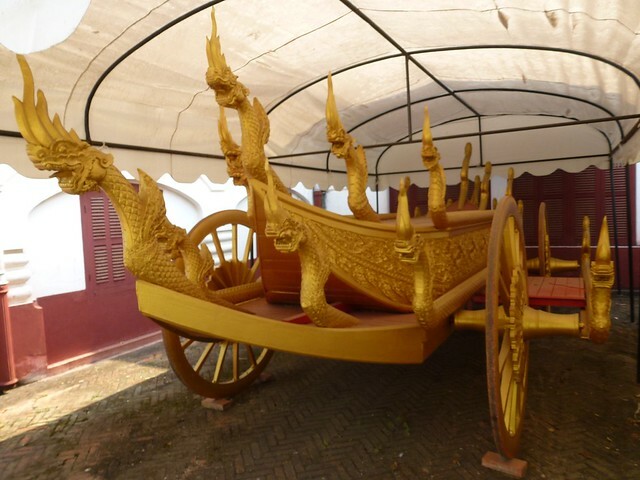 The Royal Palace takes centre stage in the middle of the town. Most of the complex can be seen by walking past on the street but we decided to take a closer look and purchased an entrance ticket which cost a couple of quid so we could roam the buildings. 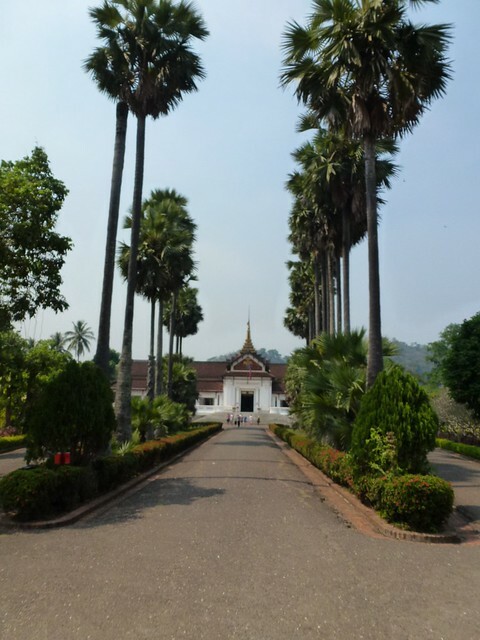 Once past the main gates there’s a long drive leading up to the main house flanked by huge palm trees. 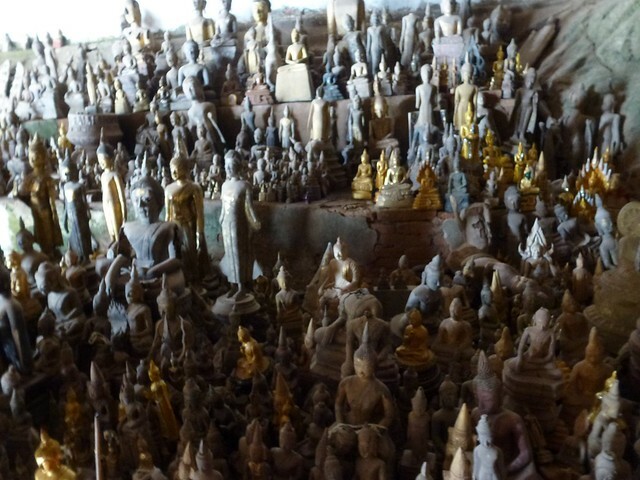 Before you get to the palace, on the right is the temple called Haw Pha Bang. It was pretty amazing from the outside and also from inside. 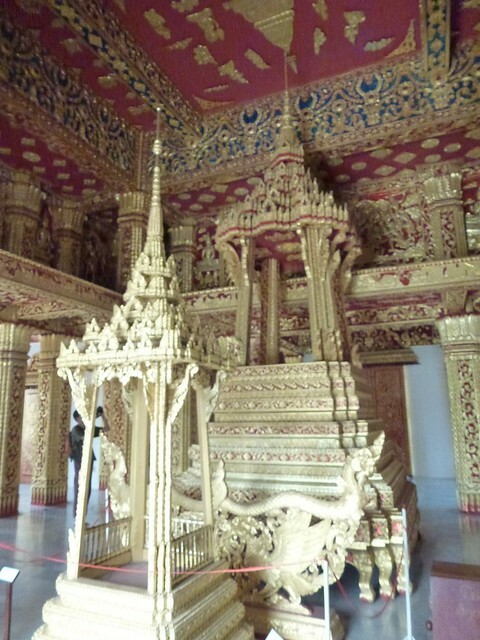 The interior of the temple was covered with gold leaf detail including some strange panels depicting every day life. 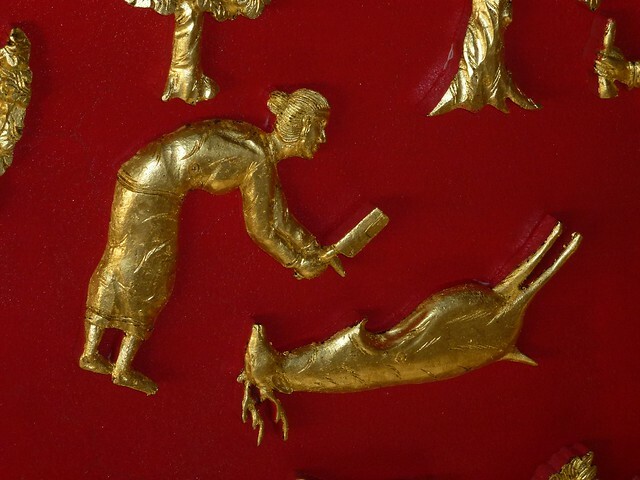 The pick of the bunch was one of a woman cutting up a deer. 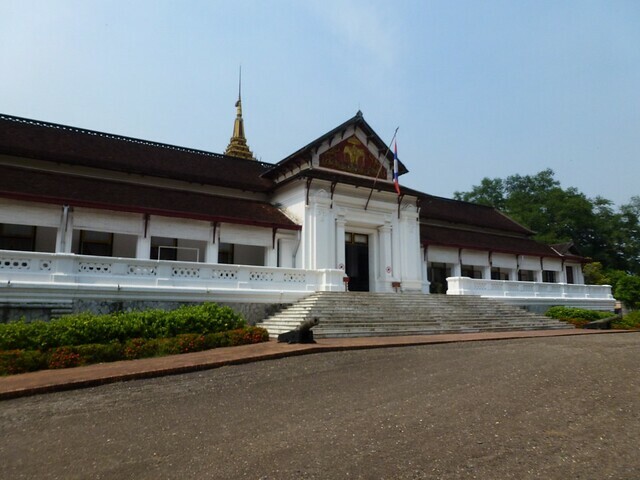 You were able to go into the palace however not cameras were allowed. 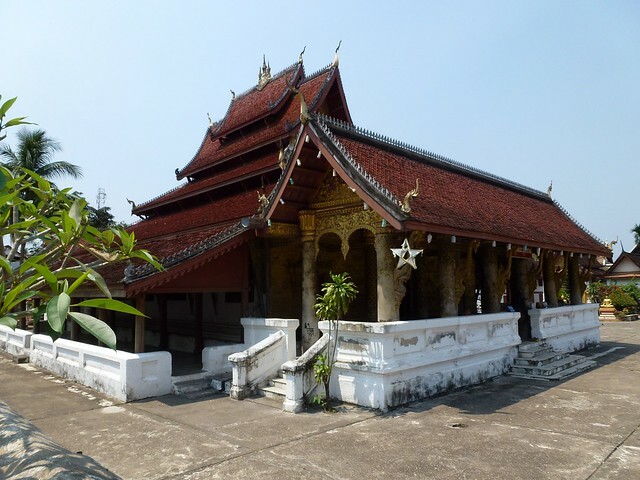 The palace was a mix of French and Asian architecture. It was really nice in the house and provided a welcome break from the heat outside. 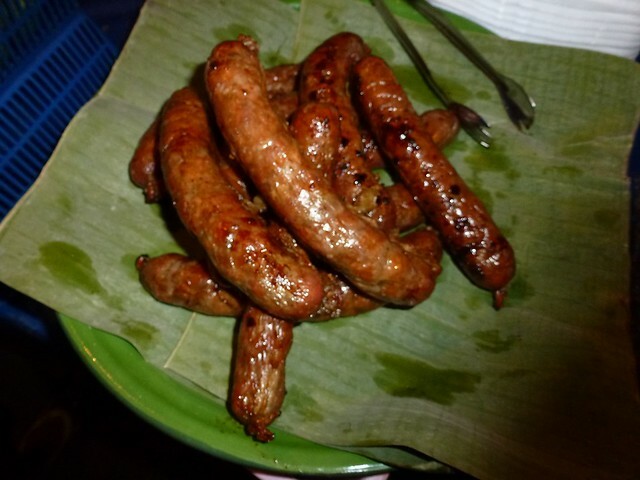 After the tour around the Palace we headed back to the hostel for a rest and decided to eat once again on the food street; papaya salad, fish again and some Luang Prabang sausage. After the meal we headed to a bar which was having a movie night. The film was Bridesmaids. The bar was full of other backpackers and we all settled down to watch the movie. 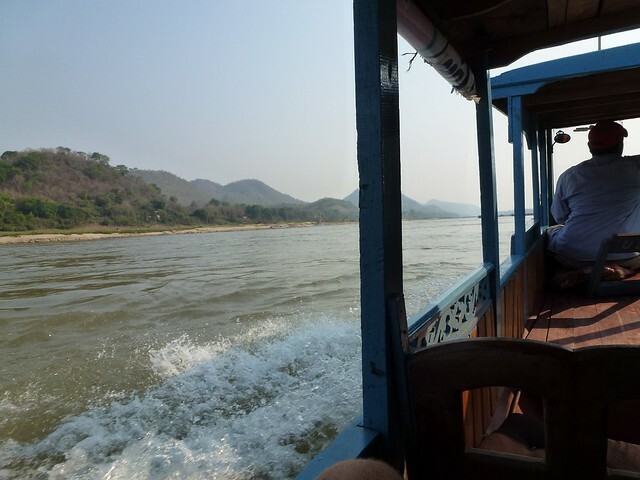 Another day trip for us today and this time we headed out on a boat trip along the Mekong River to visit the Pak Ou Caves. 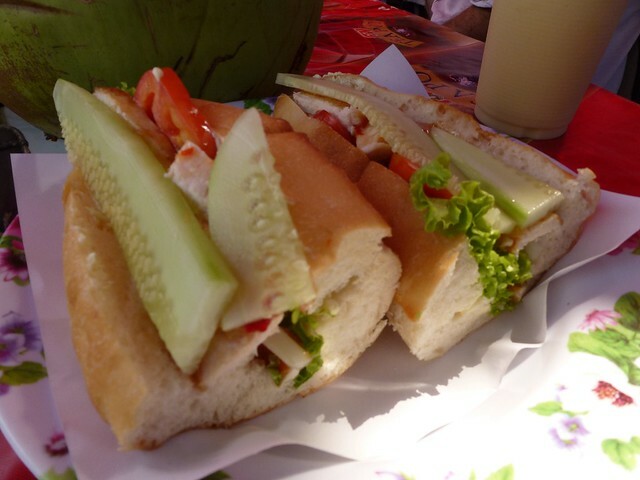 Before we left, we grabbed some food at a little stall near to the boats. 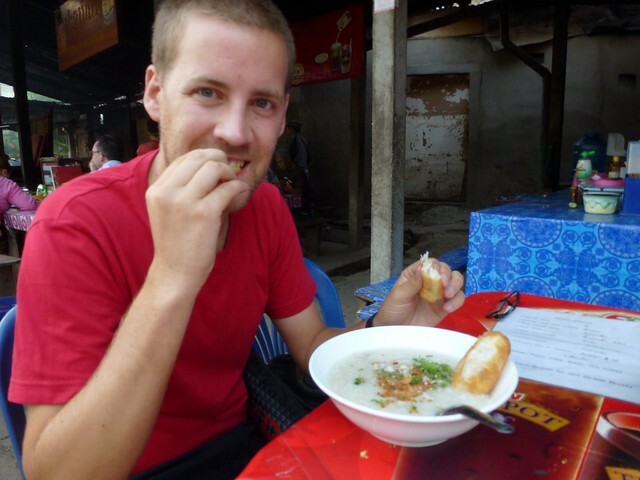 We had congee with fried bread which was amazing – made me feel at home! 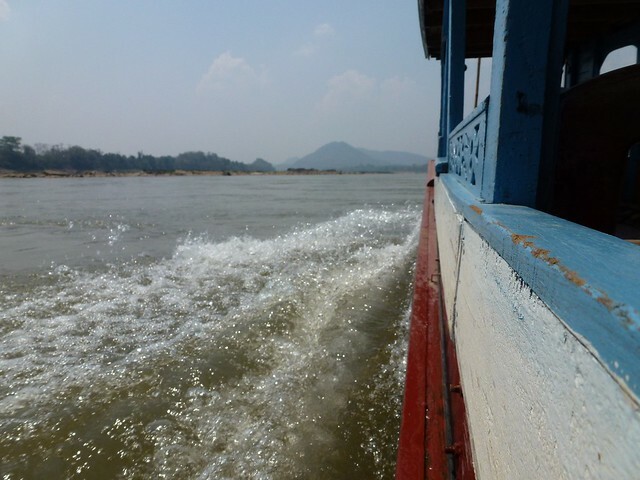 The tour was cheap and began with a ride on the boats down the river to a whisky village. The village was very quiet and it didn’t seem like it had many inhabitants. 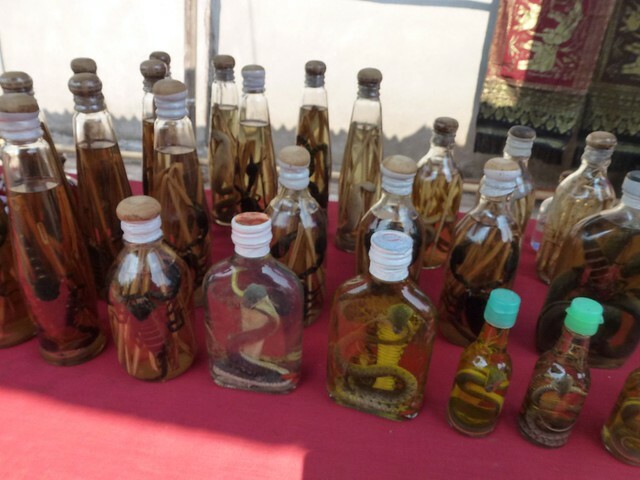 The locals were selling some souvenirs which included whisky bottles that contained snakes and scorpions that had been fermented in the drink… we didn’t buy any. 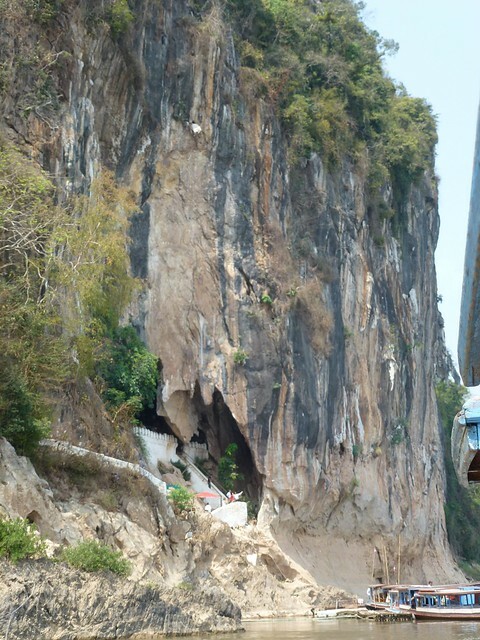 After a quick stroll around the village, we headed further up the river to the Pak Ou Caves. 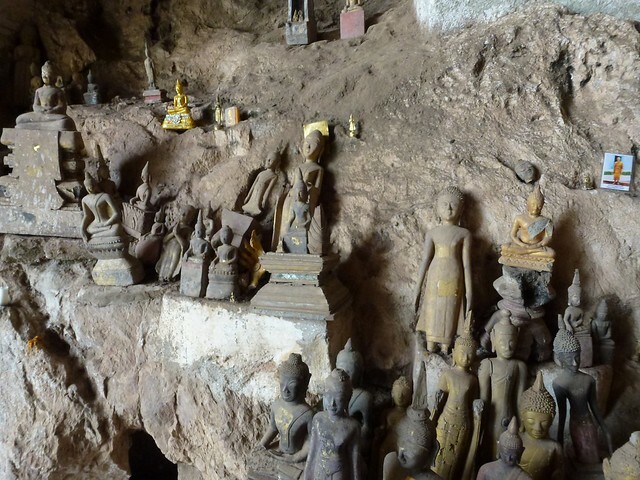 The caves are located on the river and house thousands of small Buddha statues. 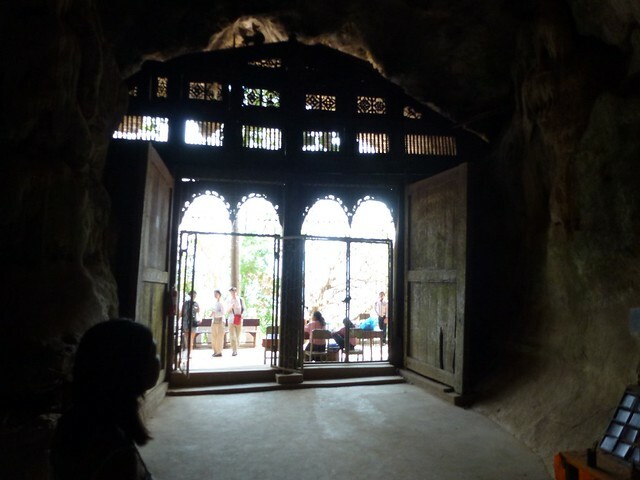 There were two caves, one down at the bottom and one at the top which took some time to walk to. 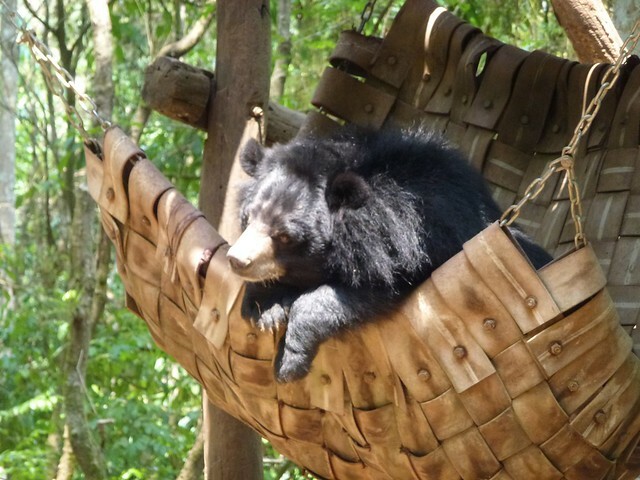 After having a rest in the cave at the top we headed back, and we kept nodding off on the way back – must have been a relaxing journey back. In the evening, we headed to a bar called Hive for a beer. 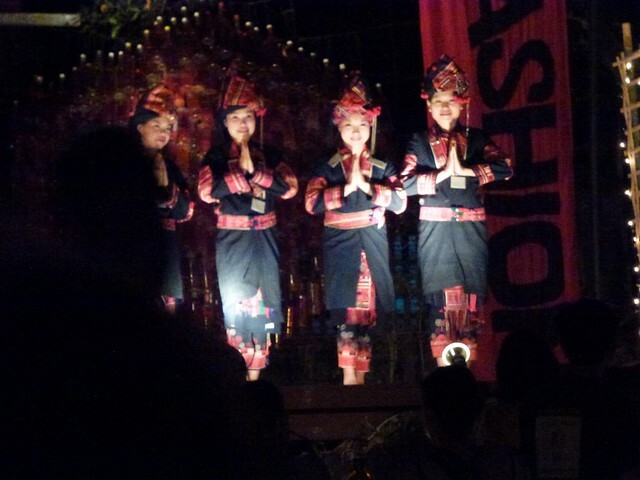 Randomly, at the back of the bar there was a fashion show. 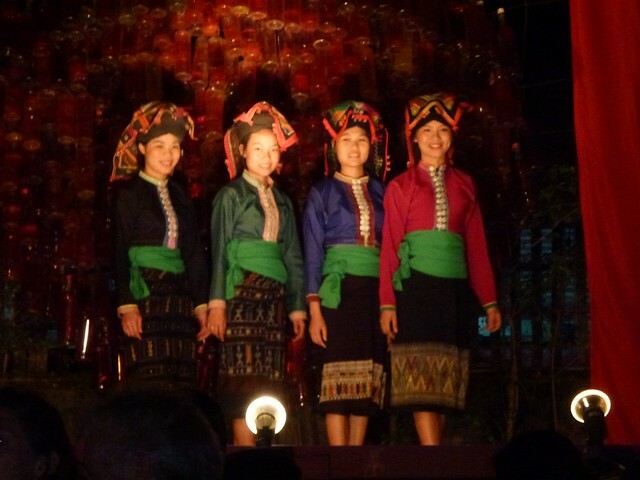 The show first showed traditional Laotian clothes and then modern clothing. After the clothes show there were some breakdancers which was a little strange but entertaining. 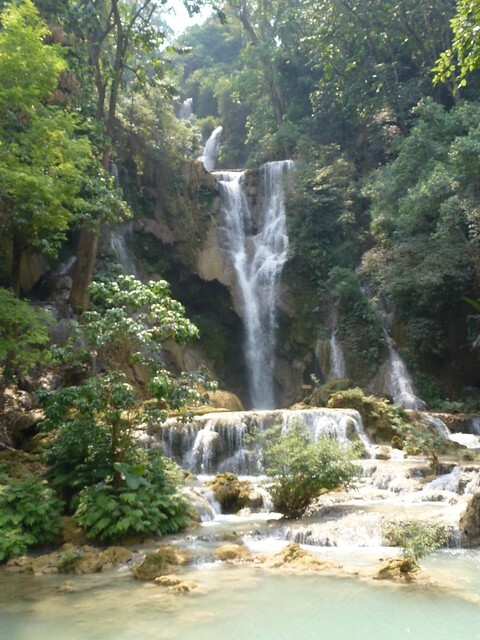 Luang Prabang is a great town to visit and the top attraction in the area is the Kuangsi Falls which is made up of several beautiful waterfalls which you can swim in. To get there we jumped in a little bus / car jeepney. 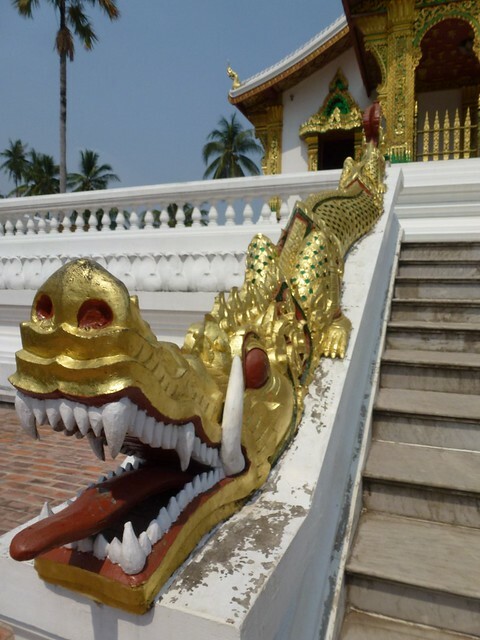 It’s around a 30 kilometre drive south of Luang Prabang. 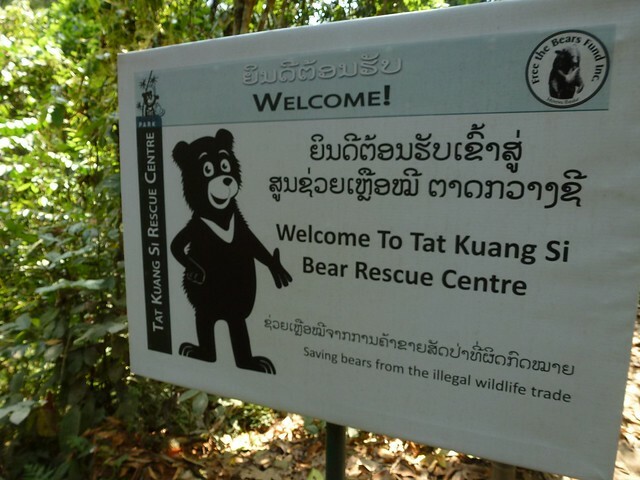 When we go to the Kuang Si Waterfall Park, we started making our way to the waterfalls but strangely before you’ve even reached the first set of waterfalls, there is a Bear Rescue Centre which housed some rescued sun bears. 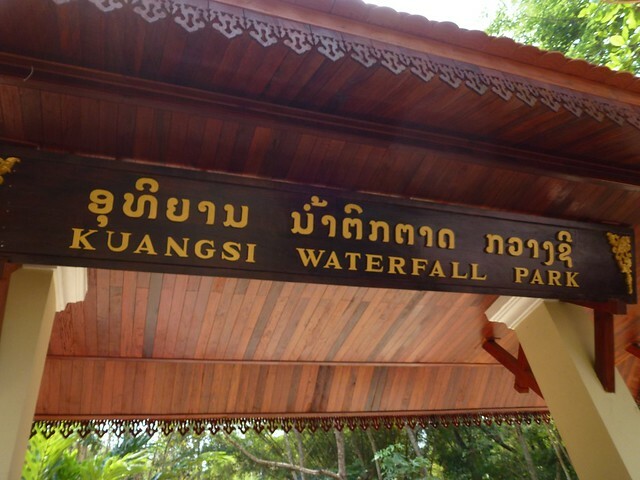 Past the bears, we reached the main attractions of the waterfalls. 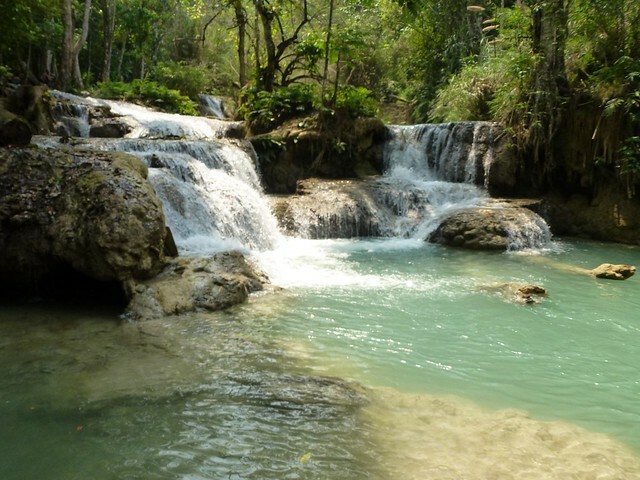 The site is made up of around three main falls with many smaller pools. The weather that day was a little overcast and the water was really cold so it was a little nippy but we went straight in. During the summer, with the temperatures soaring it would be really refreshing. The pools at the bottom of the various waterfalls made the water look turquoise. On some of the postcards at the stalls by the entrance, the water was almost blue. We had a little swim around and it didn’t take John long to go onto the rope swing. After a swim in the first and second set of pools we headed further up to the main waterfall. It was really picturesque and with no swimming allowed in the top pool, it made for a great photo. At that point, the footpath went a little steep and I only had flip flops on, so John carried on to get a view from the waterfall behind us in the picture above. 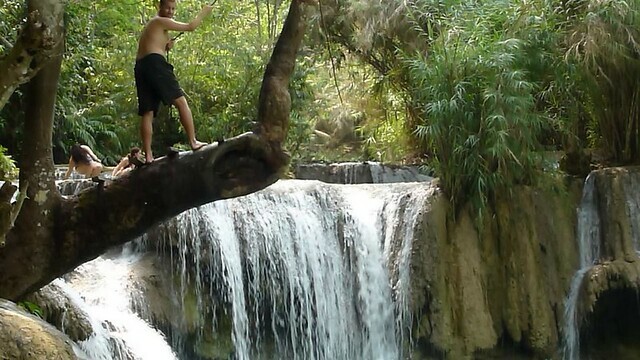 He climbed up the small path and was surprised to find a small pool to swim in at the top of the waterfall. 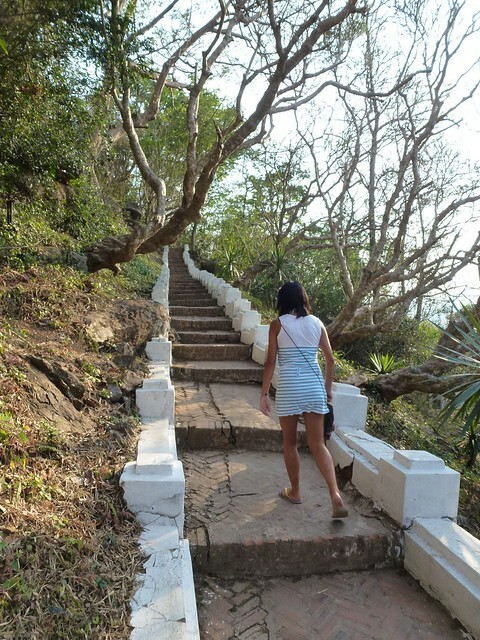 All there was to stop people from falling over was a small bamboo pole. We walked back down and then had another swim but you could tell the weather was about to change. We headed back to the entrance where there was a small cafe and decided to grab some food while it started to rain. It then went a little crazy. 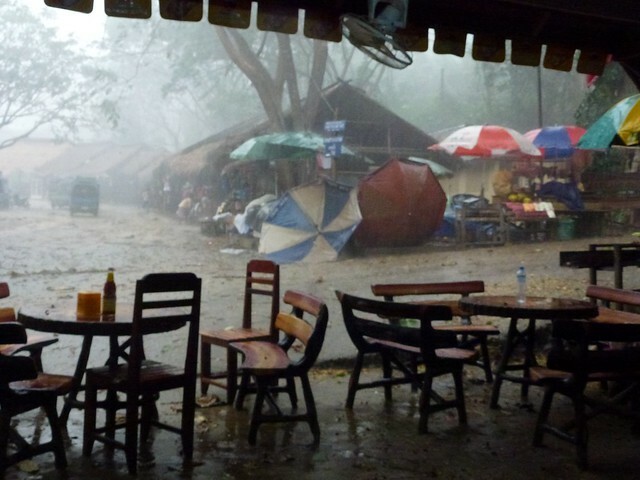 The wind picked up, the rain started to thrash down, there was thunder and lightening – another mini-storm wreaking havoc. It was very similar to the storm we encountered the other night at the bar, but this one was one notch higher on the scale. Branches started to fall from the trees as people ran for cover in the restaurant. Then as the storm was passing, people came running out of the waterfalls to get a car as someone had been hit by a branch. We didn’t see the guy but gossip travels fast among tourists and we heard that a huge branch fell off a tree by the waterfalls, hit this guy on the head, knocked him out, and was covered in blood. He was placed into the back of a jeepney which rushed him to the hospital. We saw the jeepney with the guys leg sticking out from the back. The storm passed as quickly as it had started. It was a strange end to a really fun day. The fish from the night market didn’t agree with John as yet again he had stomach troubles. 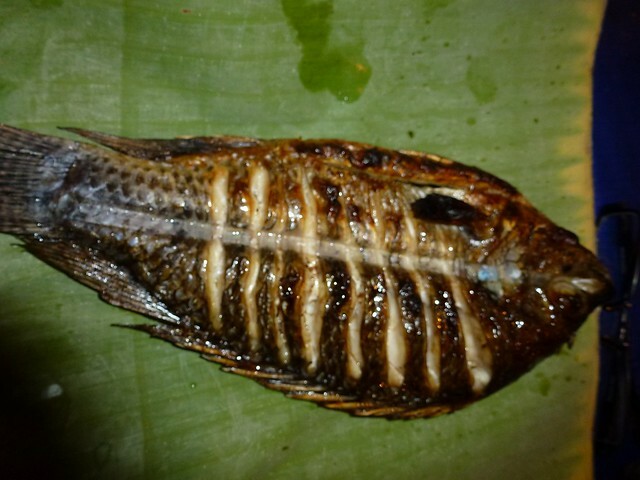 I ate half the fish but didn’t seem to have any problems. We took it easy in the morning only heading around the corner to get some food. 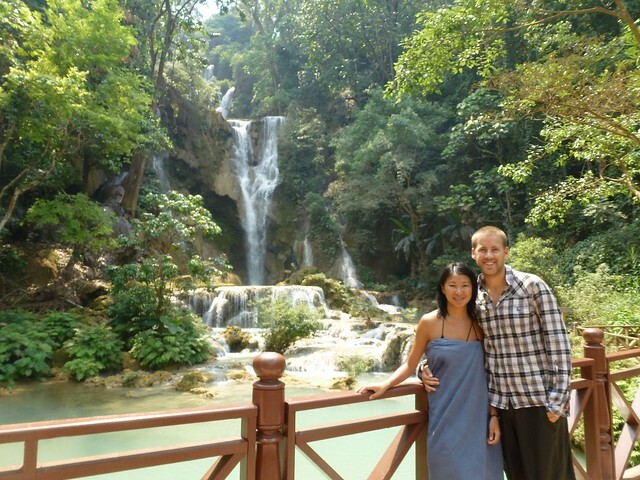 With John having to stay near the bathroom, we also sent the morning doing some research into a day trip to the famous Kuangsi Waterfalls. 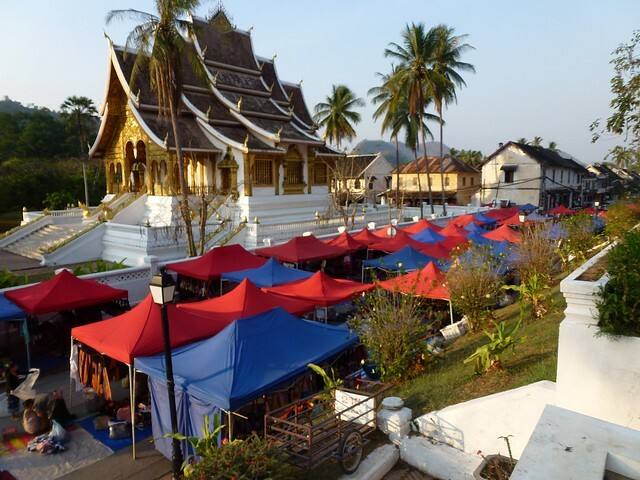 Laos has been previously occupied by the French and their influence still remains in the country – in the buildings as well as in the food, namely the baguette! The baguette has become part of the locals diet and there were loads of stalls selling baguette sandwiches with pretty much any kind of filling. We grabbed one each for breakfast. It was ok, nothing amazing, but a great budget eat. We headed back to the hostel and proceeded to have a good nap. I think around 3 hours while John continued to visit the bathroom which we now found out was infested with ants. After the nap we headed out to a really nice hotel / restaurant for an afternoon snack at a place called Arthouse Cafe. 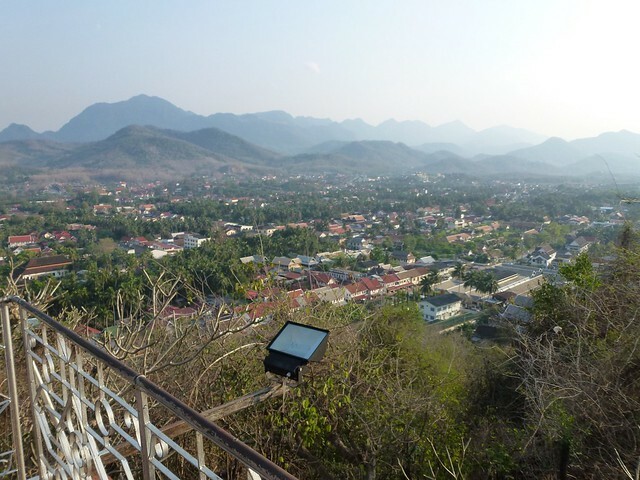 The food gave us some energy and by now, John was feeling much better, so we decided to climb up the hill in the middle of the town called Mount Phou Si. 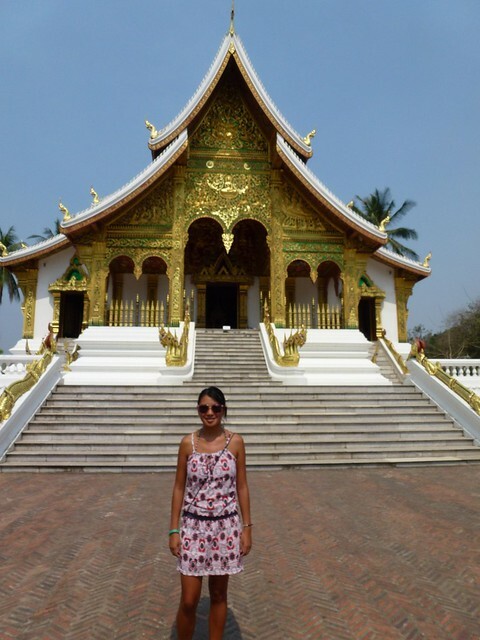 At the top there is a small temple with a great view. It wasn’t too steep to climb up and we reached the peak fairly quickly. The view from the top wasn’t disappointing. After a little rest at the top we headed back down. 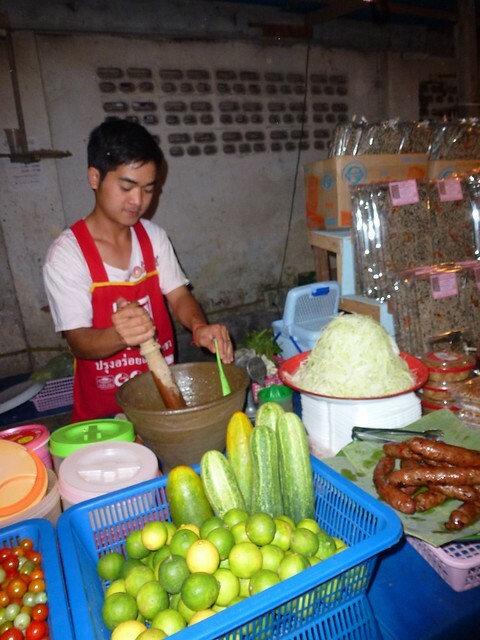 By then, the night market was all set up along the street and we headed back to the food market to have a buffet. John was still eager even after the dodgy stomach – it was 80p a plate after all. There are several of these buffet style stalls to choose from and you literally grab a plate and pile as much as you can on it for a measly 80p. What a bargain! 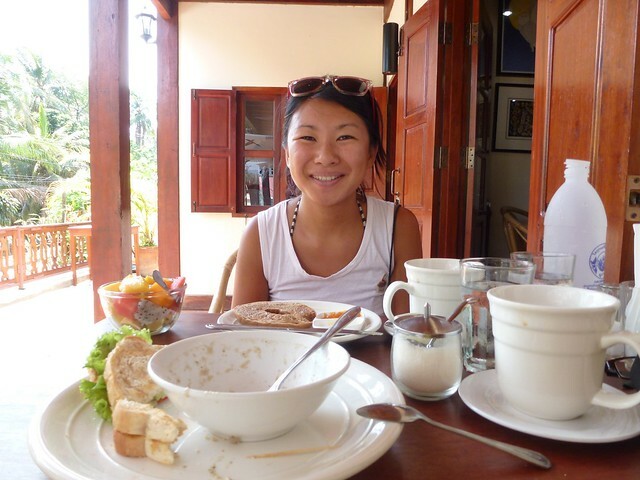 The food is all pretty standard with noodles, rice, variety of meats and veg.